欢迎随时拨打我们的电话 020-2264 4217、发邮件到 sales@pomine.com，或者填写 产品咨询表 咨询相关事宜! 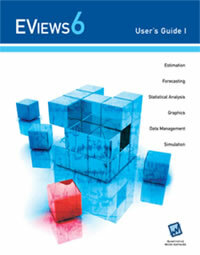 EViews 6 features a wide range of exciting changes and improvements. The following is a brief summary of some of the most important new features in Version 6. • Nonlinear estimation, model solution, and other operations involving evaluation of series expressions are significantly faster since EViews now compiles expressions to native machine code. • Using Windows XP with the 3G switch, Vista, or 64-bit XP or Vista, data capacity can be up to two and one-half times as large as under EViews 5.1. • EViews 6 features a new factor analysis object that allows you to: (1) compute covariances, correlations, or other measure of association (if necessary), (2) specify the number of factors, (3) obtain initial uniqueness estimates, (4) extract (estimate) factor loadings and uniquenesses, (5) examine diagnostics, (5) perform factor rotation, (6) estimate factor scores. You may select from a menu of automatic methods for choosing the number of factors to be retained, or you may specify an arbitrary number of factors. You may estimate your model using principal factors, iterated principal factors, maximum likelihood, unweighted least squares, generalized least squares, and noniterative partitioned covariance estimation (PACE). Once you obtain initial estimates, rotations may be performed using any of more than 30 orthogonal and oblique methods, and factor scores may be estimated in more than a dozen ways. • Principal components analysis in EViews 6 has been greatly enhanced. You may now display line graphs of the ordered eigenvalues (scree plots), and examine scatterplots of the loadings and component scores (biplots). Loadings and component scores may now be computed with various weightings so that you may, for example, construct orthonormal or eigenvalue matching scores. • In addition to the previously supported ordinary (Pearson) correlations and covariances, you may now compute alternative measures of association: Spearman rank-order, Kendall's tau-a and tau-b, as well as partial correlations and covariances. EViews 6 now performs pairwise tests of zero correlation, with or without multiple comparison adjustments. • Mean equality tests (ANOVA) now perform tests both under the standard maintained assumption of equal variances across subgroups, and now, under the assumption that the variances are heteroskedastic (Welch 1951, Satterthwaite 1946). • Linear quantile regression and least absolute deviations (LAD) specifications (Koenker, 2005) may now be estimated. Asymptotic covariance matrices for the quantile regression estimates may be calculated assuming i.i.d. errors, Huber's Sandwich, or bootstrap methods. Specialized tools permit you to test for slope equality across quantile estimates (Koenker and Bassett, 1982), or to test for symmetry across quantile estimates (Newey and Powell, 1987). • EViews 6 provides stepwise regression tools for variable selection in ordinary least squares models. Among the methods and criteria that EViews supports are: undirectional-forwards, uni-directional-backwards, stepwise-forwards, stepwise-backwards, swapwise-max R-squared increment, and combinatorial. • EViews 6 offers expanded heteroskedasticity testing (including Breusch-Pagan (1979), Godfrey (1978), Harvey (1978), Glejser (1969)), as well as the ability to specify custom tests in which you can test against departures from the homoskedastic null in a number of directions (say, by combining a White and Harvey test). • EViews 6 now offers the Quandt-Andrews Breakpoint Test (Andrews, 1993 and Andrews and Ploberger, 1994) which tests for one or more unknown structural breakpoints in an equation's sample. • The Binary, Count, Censored, and Ordered equation estimation methods now permit you to specify your equation by expression (instead of restricting you to providing a list). This flexibility allows you to construct non-linear index specifications, or models with coefficient restrictions. • You may now perform cointegration tests with panel and pooled time series cross-section data using the panel cointegration statistics of Pedroni (2004), Pedroni (1999), and Kao (1999), or the Fisher-type test suggested by Maddala and Wu (1999). • EViews now estimates multivariate GARCH models, providing support for the most popular multivariate specifications: Conditional Constant Correlation, the Diagonal VECH and (indirectly) the Diagonal BEKK. You may estimate the model assuming multivariate normal or multivariate t-distribution errors. Once estimated, you may examine the fitted conditional covariances, variances, and correlations and save results to your workfile. In addition, you may perform residuals tests on the raw or standardized residuals, where the latter may be computed using various standardization methods. • EViews 6 allows you to estimate integrated univariate GARCH models, constraining the persistent parameters of GARCH model to sum up to unity. The constant term in a GARCH model can be restricted, or the variance targeted, so that the long run variance of the model equals to the sample variance of the data. Users may now choose the weight when backcasting is used to calculate the pre-sample variance. We have completely revamped our graphics engine, allowing you greater control over the display of data, and supporting the construction of categorical graphs. • New basic graph types: Dot plot, Area Band. • Graphs may easily be displayed for summary statistics of your data (e.g., showing a bar graph of the mean values of each series in a group). • Histograms, boxplots, or kernel density graphs may be displayed in the margins of observation (line, bar, scatter, etc.) graphs. • EViews 6 offers a number of new univariate statistical graphs: histograms with options for controlling bins, frequency polygons, histogram edge polygons, average shifted histograms, fitted theoretical distribution plots (e.g., a normal density fit to sample data), empirical log survivor plots, confidence ellipses. • In addition, statistical graphs may now be overlaid on other graphs so that you may, for example, draw a kernel density and fitted normal distribution graph on top of a histogram, or you can overlay both a fitted linear regression line and a kernel regression plot on top of a scatterplot. • EViews 6 now supports line graphs containing mixed frequency data. • You may now save EViews graph output in .bmp, .gif, .png, and .jpg formats. • Displaying a bar plot comparing the mean incomes of individuals living in each state. • Producing a scatterplot of wages and hours worked, where the subset of males is drawn using one plotting symbol, and the subset of females uses a different symbol. • Showing wage-education profiles for both male and female workers. • Drawing histograms and boxplots of wages for union and non-union workers in different industries. • Data may now be assigned to any axis (including bottom and top). Among other things, this allows you to produce rotated graphs. • EViews 6 supports character labeling of axis using the workfile structure, with optional rotation of the label. • You may now specify custom label elements for axes in frozen graphs. • EViews 6 offers a new spool object that allows you to create collections of various EViews output. The EViews spool object is essentially a container that allows you to store multiple tables, graphs, text, and spools. Various management tools allow you to add, delete, extract, resize, annotate, hide and edit the objects in the spool. You may find spools to be useful for organizing results, for example for creating a log of the results for a project or an EViews session, or perhaps for gathering output for a presentation. • A new solution algorithm has been added to models. Broyden's method is a quasi-Newton method that uses a secant approximation to the Jacobian instead of the true Jacobian when solving for the Newton step. The method has many of the desirable properties of Newton's method without requiring the Jacobian to be evaluated and factored at each step. • The model solver can now reorder equations within simultaneous blocks so that a set of variables in the block can be solved recursively, conditional on the values of the remaining variables in the block. This structure is used by the Newton and Broyden solution algorithms to substantially reduce the time required to solve models consisting of large sparse systems of equations. • Stochastic simulations can now be based on bootstrapped residuals as an alternative to normally distributed random numbers. Bootstrapped residuals may be drawn independently for each equation, or may be drawn from the same period across all equations. • The complete set of results from each repetition of a stochastic simulation can now be saved as a new page in the workfile. • Equations for endogenous variables can now be excluded from the model (treated as exogenous variables) automatically based on whether actual values are available for the variable in each period. This makes it easy to perform forecasts using all available data when some series may be obtained more quickly than others. • Series imported into workfiles from a database can now maintain a link to the source database, allowing the data to be refreshed from the database each time the workfile is opened, or upon user request. • EViews 6 provides over 100 new series expression functions, including new sets of functions for moving statistics (e.g., @movstdev), cumulative statistics (e.g., @cumstdev), and statistics on the rows of a group (e.g., @rmean, which computes the mean across the series in the group), financial calculations (various present value and rate calculations), ranks, and maximum likelihood and unbiased variance calculations. • New matrix language functions for various element operations (matrix element multiply divide, power), and for row and column scaling. • Series classification tools allow you to create classification variables based on the values in a series. You may use this to create custom "binning" of series, for example, using an income series to group observations into categories using a grid of income values, marginal tax brackets, or quantiles of income. • New functions allow you to start the Windows command shell or to spawn a process from within EViews.